Chelsea Green has been publishing books “for the politics and practice of sustainable living” since 1984. While such a tag line could easily be seen as green washing, a quick look at their titles shows that this mission-driven publishing house is looking to sell more than words. Books they publish are helping push forward sustainable agriculture, either on a very functional level, through how-to’s, or in broader terms, supporting the kinds of thinking required to envision and enact change. A strong seller on their backlist is Elliot Coleman’s The Four Season Harvest. This book led to a lot of winter spinach in the Northeast, and its legacy can be traced to the USDA’s pilot project on high tunnels. More recent titles include Sowing Seeds in the Desert by Masanobu Fukuoka, author of the classic book on thinking about nature and agriculture, The One Straw Revolution. The New Horse Powered Farm serves an emerging interest in decoupling farms from fossil fuels. These books reflect the company’s core connection to the land and to sustainability. This finding involves active seeking. Editors keep their eyes peeled for people and projects in the media and in the real world. Two recently published books – The Organic Grain Grower and Cows Save the Planet – demonstrate how this radar works. The Organic Grain Grower by Jack Lazor began two years ago, when (now former) editor Makenna Goodman saw a presentation at the summer NOFA (Northeast Organic Farming Association) conference. She approached the farmer, and shortly afterwards, he submitted an outline for a possible book. Lazor’s Butterworks Farm is known by consumers for its yogurt and dairy products. He is a known quantity in the farming community, too. He and his wife Anne began farming as ‘back to the landers’ in the late 1970s. Tucked up in Vermont’s Northeast Kingdom, Lazor has learned a great deal about grain farming from observing his Canadian neighbors. Anecdotes in this hefty, how-to manual feature lessons in growing styles and seed varieties gleaned from farmers in Canada. The book is well written, and outlines the details of growing grains in the Northeast. Chapters begin with small histories of each grain, and follow the subject through Lazor’s experiences, both good and bad. He knew it was important to include his mistakes, he said, because he wanted people to see where things can go wrong. Though this is his first book, beautiful phrases like “a whisper of wind” pepper the text, evidence of a successful transition from storyteller to author. Timing on this book is perfect to support a rising interest in regional grain production. Markets for local wheats, for flour and barleys and for malt are expanding, so curious farmers can take guidance from Lazor’s recommendations on soil prep, seed selection, and all sorts of planting and harvesting equipment, ranging from hand tools to inexpensive older equipment, all the way up to more modern machinery. “If we see a need or feel there’s an emerging trend, we try to identify practitioners and farmers who have an ability to tell the story,” said Totten. Chelsea Green also seeks out storytellers who can add to the body of knowledge on a subject and help advance general thinking in an area. 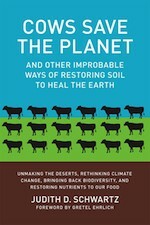 Cows Save the Planet: And Other Improbable Ways of Restoring Soil to Heal the Earth by Judith D. Schwartz is a big picture book that fits this model. Schwartz is a journalist with several books under her belt. Chelsea Green’s president Margo Baldwin found her in the pages of Conservation magazine, where Schwartz had written a profile on holistic management specialist Allan Savory. Baldwin contacted Schwartz about a possible book on Savory. Such a book would involve spending a lot of time in Zimbabwe, and another writer was already immersed in his work. But Schwartz had another idea. “I’ve been doing a lot of thinking about soil,” she said she told the publishers. What followed was the kind of discussion that comes from people who are very informed on a topic. Working with a publisher in this fashion, who sees books that fit into themes that serve the company’s mission, was a very different experience. Now that her book is in the world, she’s sensing camaraderie with other Chelsea Green authors. For instance, she was happy to see Gary Nabhan’s op-ed piece in the New York Times because it helps engage public thought about agriculture and climate. His book, Growing Food in a Hotter, Drier Land came out last year. “You feel like all the authors are in this ongoing conversation and the books build on each other,” said Schwartz.